Cartoon from Katie Miranda and articles from 1) Channel 4 news, 2) Christian Science Monitor – short extract; 3) Electronic Intifada and Notes and links. Some of the many cartoons that have been launched into cyberspace are interspersed throughout. Scarlett Johansson quits her role as ambassador for Oxfam after coming under huge criticism for supporting the company SodaStream, that operates in an Israeli settlement in the West Bank. The Hollywood actor’s global debut as the face of Israeli company Sodastream will take place on Sunday in a prime time advert during the Super Bowl. But the multi-million dollar deal has caused a huge backlash from pro-Palestinian activists and humanitarian groups, because SodaStream’s largest factory is based in a Jewish settlement in the occupied West Bank. After talks with Oxfam this week, the star of awards season favourite Her has decided to stick with the company and end her seven-year association with the charity. Her spokesman said in a statement that she and Oxfam had a "fundamental difference of opinion in regards to the boycott, divestment and sanctions movement". It added that she was "very proud of her accomplishments and fundraising efforts during her tenure with Oxfam." Settlements by Israelis on the Palestinian West Bank are illegal under international law, and Oxfam and other human rights groups are against any trade with companies based there. And since the sponsorship deal was announced, the charity has come under huge pressure to drop Johansson as an ambassador. Activists encouraged alternative names for SodaStream flavours using the hashtag #ScarJos, which included Doctor Pepper Spray, Gaza Calorie Count and Palestinian Punch. Johansson has pointed out that the company employs both Palestinian and Israeli workers, and affords its employees salaries that are triple the national average. SodaStream, which produces bottles and home soda makers, said it employed the highest number of Palestinians in the region. Yonah Lloyd, SodaStream’s president, told the Financial Times: "The boycotters are actually demonstrating a complete lack of humanitarian sensitivity to the thousands of people that benefit from the stable economic opportunity that we provide." 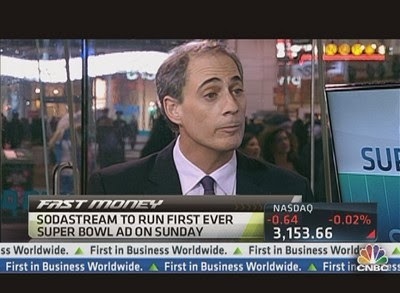 Yonah LLoyd promotes the Sodastream superbowl ad on CNBC ?video=3000144365 6 minutes in for a completely apolitical interview. The actor said last week that she was a "supporter of economic cooperation and social interaction between a democratic Israel and Palestine." "Ms. Johansson’s role promoting the company SodaStream is incompatible with her role as an Oxfam global ambassador. The Israeli Jewish settlements on land seized in the 1967 Six Day War are a key point of contention in the US-backed peace talks between Israel and Palestine. US Secretary John Kerry has called them "illegitimate", but Israel has continued to build and develop on land on the West Bank, despite its illegality. "The very existence of (Israeli settlements) amounts to a serious violation of international law," the New York-based Human Rights Watch said in a statement on Wednesday. "It is impossible to ignore the Israeli system of unlawful discrimination, land confiscation, natural resource theft, and forced displacement of Palestinians in the occupied West Bank, where SodaStream is located." The Palestinian BDS National Committee, that supports boycotts and sanctions against Israel, said that Johansson had abandoned her reputation in exchange for money. "Just like the few artists who played Sun City during South African apartheid, Johansson will be remembered for having stood on the wrong side of history," said spokesperson Rafeef Ziadah. "This controversy has shined a light on the fact that SodaStream is at the heart of Israel’s system of occupation, colonisation and apartheid." EXTRACT from article which begins with reports from Palestinians who are glad to have jobs at Sodastream because there is so little paid work available in the West Bank despite the PA’s donor income. One of the workers waiting for the SodaStream bus this morning says he hates the fact that he’s working in an Israeli settlement, and lies to people when they inquire about his work. "I’m ashamed I’m working there," he says. "I feel this is our land, there should be no [Israeli] factory on this land." He feels like a "slave," working 12 hours a day assembling parts – drilling in 12,000 screws a day, he adds. While Israeli labor laws technically apply in the settlements, labor rights organization Kav LaOved says it is poorly enforced. Inspections, which are considered the essence of labor law enforcement, are reportedly sparse. Abed Dari, the organization’s field coordinator in the Jordan Valley and Mishor Adumim, the industrial zone where SodaStream’s factory is located, estimates that 95 percent of Palestinian employees of Israeli businesses in those areas do not earn the minimum wage of 4,300 shekels ($1,230). Dari says SodaStream is one of the few companies in Mishor Adumim that does pay minimum wage, but adds that his organization’s worker hotline received a complaint about some 100 workers being fired recently, due to "seasonal" hiring practices. Workers in Azzariah mentioned that some fellow workers had recently been let go, which they attributed to boycott pressure. As one of Israel’s largest food and beverage exporters, which ships to 45 countries, SodaStream indeed has international reach – and thus is potentially more vulnerable to international opinion. But Yonah Lloyd, president of SodaStream, says the company does not act in response to boycott pressure. The 8.5-minute video focuses on the firm’s factory located in Mishor Adumim, the industrial zone of the illegal Israeli settlement Maale Adumim in the occupied West Bank, and its Palestinian workers. The underlying message throughout the video is that the company’s settlement factory is a "fantastic sanctuary of co-existence" and, despite being built on stolen Palestinian land, is beneficial to the Palestinian economy and workers. "I feel humiliated and I am also disgraced as a Palestinian, as the claims in this video are all lies. We Palestinian workers in this factory always feel like we are enslaved," M. said. M. and his fellow workers were unaware of the boycotts. "They never told us about boycotts at all," he remarked. Instead the premise for the video presented to the workers was nothing less than a way to maintain their jobs, otherwise at risk due to a lack of orders. M. said that "When they came and told us about the video, they announced that they wanted to market SodaStream globally, with a special presentation to the US, and they wanted to show the work and how it was improving." M. and his coworkers had been told that the company planned to "let some of the workers go before the end of the year," but a $500-million order from the US had changed things and a "campaign to support the company’s sales" would save their jobs. The YouTube video is clearly part of SodaStream’s public relations campaign, which lately has focused on the company’s Palestinian workers. In a speech given in early February at an Israel Advocacy Seminar in Johannesburg, Amir Sagie, director of the civil society affairs department for the Israeli foreign ministry, stated, "SodaStream have appointed lobbyists — an initiative that is paying dividends" ("Trends to expect from BDS & how to klap them," MyShetl, 6 February 2013). According to M., the workers appearing in the video were given instructions on what to say. "I actually saw the company preparation work [for the video]; they were preparing all the workers and telling them what to say and how to say it," he said. "I have worked here for a long time, and I have never seen him at the factory. This is the first time I see him [in the video]. They have their offices in Israel, and they do not come here," he said. By M.’s estimates, SodaStream employs 800-850 workers on the factory floor, 90 percent of whom are Palestinians. The only Jewish Israelis doing "hand work" are "new immigrants, as they call them; olim hadashim or the ‘black Jews’ as they describe them." Only a tiny fraction of the Palestinians employees hold higher level positions and there are none at all in management. "In all of SodaStream, there are only two foremen who are West Bank Palestinians, and they are supervised by two Israeli Arabs," said M.
When asked if there was discrimination between black and white Jews, M. replied, "Yes, for sure. You will not [find] white Jews wearing yarmulke [a skull cap] doing the hard work or ‘hand work.’ The supervisors who run the factory are mainly Russian and they are managed mainly by the white Jews, and we are ‘Palestinians,’ only workers." M. also talked of discriminatory hiring practices, explaining that "most Israelis are hired through the company directly," while West Bank Palestinians require "a special security permit to be employed." The settlement factory has an internal security officer who "takes care of applying for the permits from the Israeli authorities." M. added that Palestinian workers from Jerusalem, along with immigrant workers and African Jews, work through external manpower companies and may be hired after nine months "if they prove to be good workers." Otherwise, he said, "they are let go." The recent report from the UN Human Rights Council’s fact-finding mission on Israeli settlements notes that a "stringent system of permits and quotas that determines employment in Israel and the settlements lends itself to abuse by contractors and middlemen." "A good example that shocked me was the claims [in the video] about the freedom to practice our prayers," he said. "Those claims are all false. There is a full discrimination against the [Muslim] workers and we are denied our right to practice our religion." M. noted that the mosque shown in the video "is just the locker room," and that supervisors had "even hidden the carpets from the workers" in an attempt to prevent them from praying. Restrictions on are especially severe on the assembly line, where most West Bank Palestinians work. M. explained that they are only allowed to pray if prayer times fall "during their lunch break," otherwise "they are not allowed to pray at all." This is not the first time SodaStream has put its celebration of multiculturalism on promotional display. In 2009, following extensive negative press in Sweden, the workers’ rights organization Kav LaOved reported that SodaStream organized "a party celebrating the factory’s multicultural makeup: Sudanese, Ethiopian, Russian and Palestinian." 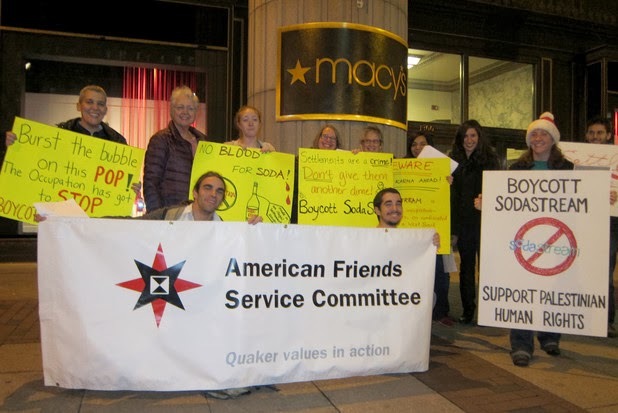 The group noted that "some of the Palestinian workers, who had not registered for the event, were only allowed to participate for one hour, and then returned to work while others continued to celebrate multiculturalism in their name" ("Multiculturalism at the Soda Club factory," 2 May 2009). While M. confirmed Palestinian workers are currently paid "three or four times the salary we can get at the Palestinian Authority" — not the four to five times more mentioned in the video — this only came about following workers’ struggles and protests in which many lost their jobs, the intervention of Kav LaOved and negative publicity in Europe, as documented by the group Who Profits from the Occupation? in a report on SodaStream ("SodaStream: A case study for corporate activity in illegal Israeli settlements," January 2011 [PDF]). However, the same job insecurity and harsh working conditions reported by Who Profits remain. M. described the working week at the factory as "from work to bed," leaving little free time for anything else. Employees work on a "four-two" system, meaning that they work for four days, 12 hours per day, with two days off — totaling 60 hours of work in a seven-day period. According to the Israeli Hours of Work and Rest Law, a working day "shall not exceed eight working hours" and shift workers "shall not be employed for more than one hour of overtime per day, and that the average for three weeks shall not exceed 45 working hours per week." The SodaStream factory has two shifts, day and night, and M. explained that workers change shifts every four days with "no day that you leave early." He also noted that "there is no extra pay for overtime or night shifts," in violation of the Hours of Work and Rest Law. Making the work day or night even longer, Palestinian workers must allow two additional hours for transportation to and from the Israeli settlement, where they are not allowed to live. "They pick us up at six in the morning or the evening, and we arrive home at least an hour after work. Around 14 hours you are away from home, and there is no time to see our families," M. explained. SodaStream’s CEO Daniel Birnbaum has referred to the factory workers as one big family. M. disputed this portrayal, and explained some of the job insecurities Palestinian workers face: "They treat us like slaves. This has happened many times on the assembly line: when a worker is sick and wants to take sick leave, the supervisor will fire him on the second day. They will not even give him warning or send him to human resources, they will immediately fire him." Birnbaum also claims in the video that SodaStream received no government incentives for its settlement factory. However, all three of the company’s own annual reports filed with the Security and Exchange Commission in the US, including the report for 2012, clearly stated that transfer of their production facilities "to a location outside of the disputed territories" may "limit certain tax benefits" ("United States securities and exchange commission, SodaStream International Ltd."). M. noted that some production is currently being shifted to a new factory at Alon Tavor in the Galilee, within present-day Israel. "Now they have a new assembly department inside Israel, and [the factory] is getting less work. They are forcing the workers to work less, sometimes only for two or three days a week only, which means less salary." Those unhappy with just 10 to 12 work days per month "are ‘free to go,’" he added. The rumors at the Mishor Adumim factory are that it will soon close, with all production moving inside Israel. Despite the conditions, M. and others "are hoping that the workers will be able to move and continue working there too." As M. explained, "All of the workers have no other choice but to work in the settlement factory; we want to feed our children and there are no work opportunities in the Palestinian Authority." A recently-published update from Who Profits on SodaStream’s facilities showed that the Alon Tavor site serves as cover for the company’s illegal settlement factory. Who Profits cites an article from the Israeli business publication Globes, in which Birnbaum claimed products sold in countries such as Sweden, Switzerland, Norway, Finland, and France are manufactured at Alon Tavor due to "the sensitivity in these countries to Israeli products manufactured beyond the green line." The company has also won a 25-million-shekel ($7 million) government grant for construction of a new plant in the Idan Industrial Zone in the Negev (Naqab), capable of housing all of the company’s production under one roof ("SodaStream wins NIS 25 m grant for Negev plant," Globes, 4 April 2013). Birnbaum recently threatened to move production to another continent if Israeli government subsidies, such as grants and tax breaks, are reduced. According to SodaStream’s 2012 annual report, its effective tax rate was 1.7 percent for 2012, and 10.9 percent for 2011. The corporate tax rate in Israel is 25 percent ("SodaStream CEO: More Israel investment depends on incentives," Globes, 24 April 2013). While Birnbaum, beholden to his Nasdaq investors, concentrates on the bottom line, his settlement factory is part of a system described in the United Nations Human Rights Council report on settlements as exerting "a heavy toll on the rights of the Palestinians." This systematic denial of basic rights outlined in that report creates the conditions that force Palestinians to turn to settlement companies for job opportunities. The report maintains that "the inability for the Palestinian economy to expand and offer opportunities, high unemployment rates and falling wages in the Palestinian labor market, inflation and increasing poverty are factors that drive Palestinians to seek employment in the settlements and in Israel." In an email to The Electronic Intifada, a spokesperson for Who Profits stated that Israeli settlement companies exploit Palestinian laborers while claiming that the work benefits them. "A business that operates unlawfully cannot demand legitimacy on behalf of the workers and at their expense," the spokesperson said. Who Profits added that in other cases of exploitative employment, "civil society worldwide rejected employers as legitimate representatives of their workers" and maintained instead that "major corporations and colonial powers be held accountable for their actions." 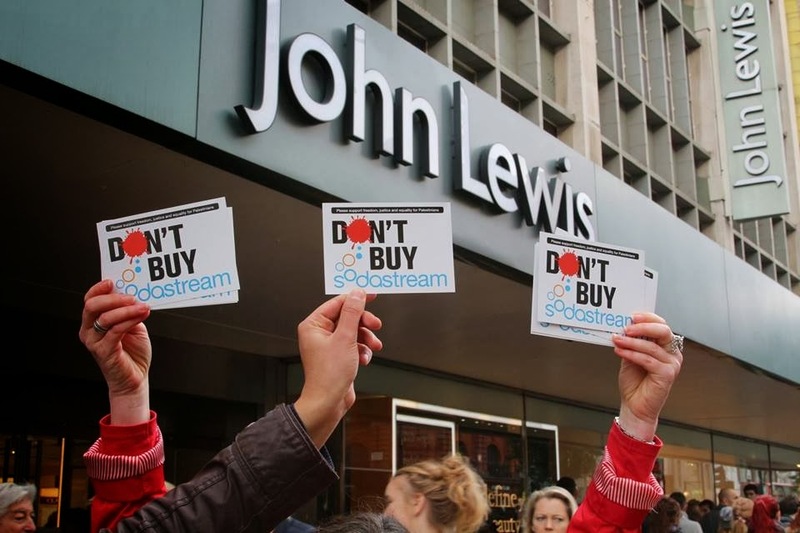 Join the regular protest to alert shoppers that John Lewis is selling Sodastream products which are produced in an illegal Israeli settlement.